We truly want to make your next home sale or purchase as easy and stress-free as possible, and one way we do that is by taking some of the hassle out of moving and relocating. 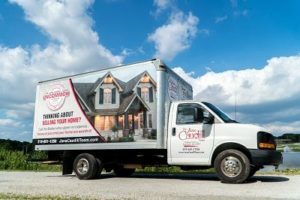 When you buy or sell a home in Northwest Indiana* with The Jana Caudill Team Brokered by eXp Realty, you will be able to use our box truck free of charge to move out of or into your home. This truck comes with a ramp, a dolly and moving blankets. This isn’t some discarded rental truck. We have our own clean, well-maintained moving truck ready for our clients to use. This is one of the many value-added services buyers and sellers receive when working with the real estate brokers at The Jana Caudill Team Brokered by eXp Realty. When you hire one of our realtors, we want you to know there’s a whole team of real estate professionals ready to assist you. Our agency will put considerable resources into making your home sale or purchase a positive experience. The free moving truck is also our way of saying Thank You for choosing The Jana Caudill Team to service all of your real estate needs. We know that choosing a new home or relocating to a new neighborhood is a big decision, and we’re honored that so many people choose our agents to help them on that journey. If you’re considering buying or selling a home, contact us today to see how The Jana Caudill Team Brokered by eXp Realty can exceed your expectations. Once a client, always a client! Call for Details. *Our moving truck is only available in Northwest Indiana. The truck is not available in the Naples and Southwest Florida areas.